When the execution is completed normally, then you can find files 'cdia.Dos.val' and 'cdia.Dos.vec' in the directory 'work'. The eigenvalues and eigenvectors are stored in the files 'cdia.Dos.val' and 'cdia.Dos.vec' in a text and binary forms, respectively. The DOS calculation is supported even for the O( ) calculation, while a Gaussian broadening method is employed in this case. Do you want Dos(1) or PDos(2)? The tetrahedron  and Gaussian broadening methods for evaluating DOS are available. Also, you can select DOS or PDOS. When you select the calculation of PDOS, then please select atoms for evaluating PDOS. In this case, each DOS projected on orbitals (s, px (p1), py (p2), pz (p3),..) in selected atoms are output in each file. In these files, the first and second columns are energy in eV and DOS (eV ) or PDOS (eV ), and the third column is the integrated DOS or PDOS. If a spin-polarized calculation using 'LSDA-CA', 'LSDA-PW', or 'GGA-PBE' is employed in the SCF calculation, the second and third columns in these files correspond to DOS or PDOS for up and down spin states, and the fourth and fifth columns are the corresponding integrated values. If you select the Gaussian broadening method, you are requested to set a parameter, value of Gaussian, a (eV), which determines the width of Gaussian defined by . Figure 15 shows DOS and PDOS of carbon diamond. 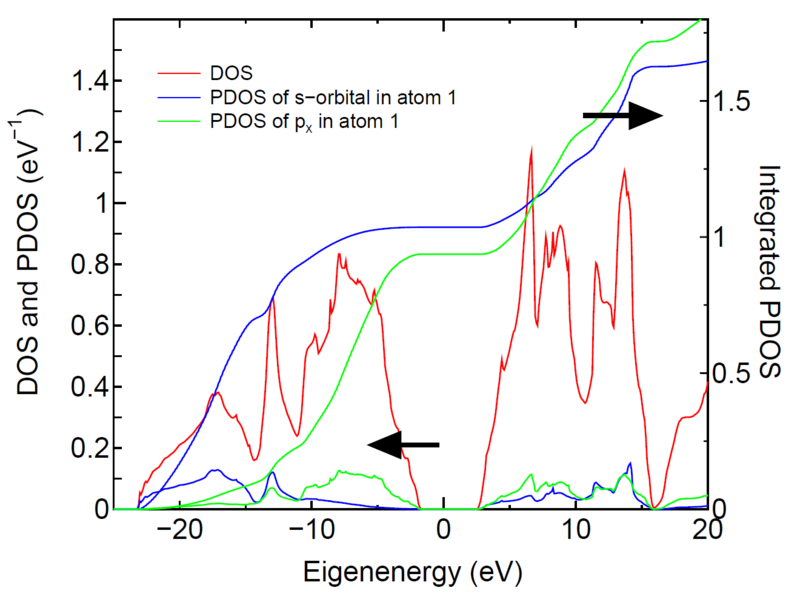 Figure 15: DOS and PDOS of the carbon diamond, and the integrated PDOS, where the Fermi level is set to zero. Since charge redistribution occurs among the s-, p-, and d-orbitals, the integrated PDOS of s- and p-orbitals at the Fermi level are not exactly 1. The calculation can be traced by using an input file 'Cdia.dat' in the directory 'work'.